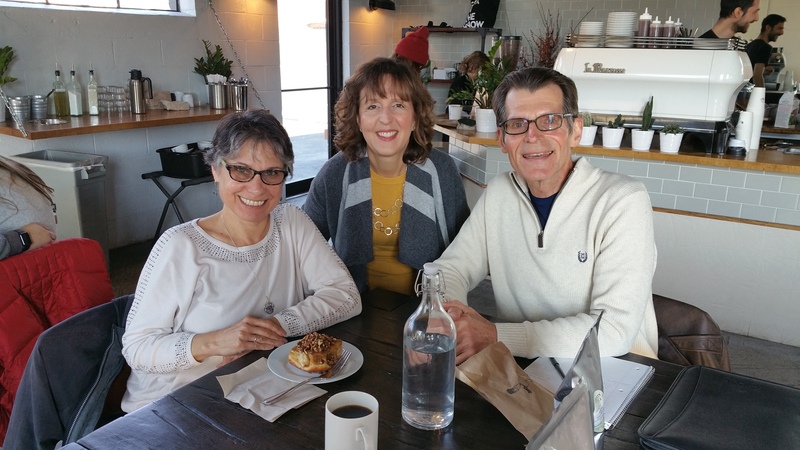 Heartland Gardening bloggers Debra Knapke, Teresa Woodard and Michael Leach recently met for a brainstorming session at Fox in the Snow café in Columbus. Feb. 14: Debra will present two talks at the OEFFA conference in Granville — What is a Plant? and Polycultures and Garden Guilds. Feb. 24: Debra will be speaking to the 2016 Delaware Master Gardener class about Annuals and Perennials. March 5: Debra will be speaking on Sustainable Gardens at Wegerzyn Gardens in Dayton. March 19: Debra will be presenting at the Oakland Nursery Spring Fling. April 8: Debra and her daughter, Sarah Arevalo, will be presenting Complementary Design: Embracing Inside and Out at LABash 2016 at The Ohio State University. May 27: Debra will give a talk at Holden Arboretum for the Council of Botanical and Horticultural Libraries. Her topic is: Books, Botany and Horticulture– a Beautiful Combination. Feb. 20-28: As the garden stage manager at the Columbus Home & Garden Show at the Ohio Expo Center, Michael Leach has recruited a speaker line-up who will cover everything from backyard beekeeping to growing your own vegetables. Feb. 21, 11 a.m.: Michael will present “Healing Gardens” at the Columbus Home & Garden Show. Spring issue: Michael’s garden will be featured in the spring issue of Columbus Monthly’s Home & Garden. Feb. 25, 2 p.m.: Teresa will discuss “Creating Prairie Strips” at the Columbus Home & Garden Show. March 12, 8 a.m.: Teresa Woodard will be give the keynote presentation “Gardening for the Health of It” at “Ready, Set, Grow!” a vegetable gardening conference sponsored by the Delaware County Master Gardeners and the local health department. April 21: Teresa will be speaking to the 2016 Madison Master Gardener class about Container Gardening. Spring articles: Look for her garden stories on the covers of Ohio Magazine (April) and Country Gardens and in the Chicago Tribune, Columbus Monthly and the March/April issue of Midwest Living.